Skunks. Weasels. Pangolins. Eurasian rollers. The animal kingdom is no stranger to creatures that use stench as a form of self-defense. But plants? That’s a new one. It makes sense, when you think about it. Plants are driven to survive just like the rest of us. The difference is that when we’re threatened, we can flee. Plants just have to sit there. To make up for their lack of mobility, plants have evolved some pretty clever defenses. Some plants shoot poison darts when in danger, while others make themselves taste really bad. 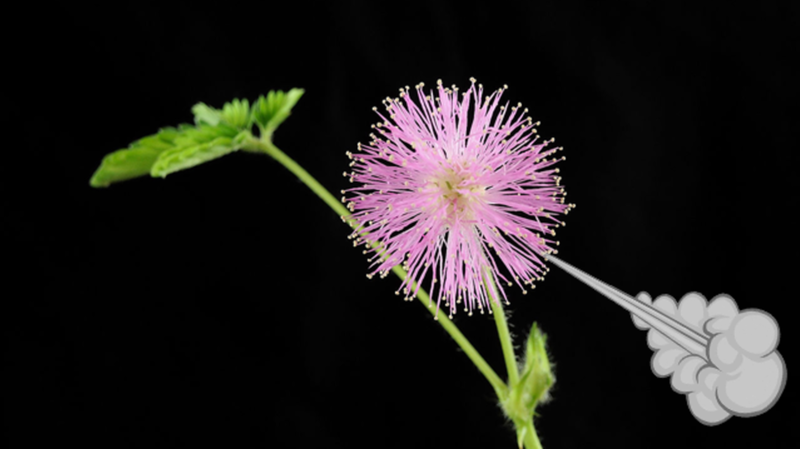 And when the going gets rough, says a new study published in Plant Physiology, Mimosa pudica plants start farting. M. pudica has a reputation for being sensitive. Because its leaves curl up when touched, it’s got common names like the “shy plant,” the “humble plant,” and the “shame plant.” But “fart plant” is a new (unofficial) one. Researchers subjected M. pudica seedlings to four highly technical experiments. In the first, they poked at the plants to see what would happen. In the second, they poked at the plants using a variety of instruments and techniques. In the third, they looked at the plant under high-powered microscopes, and in the last, they sampled the stench clouds to find out what made them stink. The second experiment yielded some very interesting information: the plants’ flatulence is highly selective. Dragging M. pudica roots across the soil or touching them with a bare hand was enough to trigger the stink alarms, but poking the roots with a glass vial or metal tweezers had no effect. Where do the farts originate? When they zoomed in on M. pudica under the microscope, the scientists found tiny hairlike sacs, no bigger than 0.02 inches each, running along the roots. After the plant releases its smelly gases, the sacs deflate, which suggests they act as the plant’s stench storage units. The fart itself was made of “highly reactive and elusive organosulfur intermediates,” the researchers wrote in their paper. Organosulfurs are the compounds responsible for the nasty smell of polluted air and water, but they also contribute to the pleasing aromas of mushrooms, garlic, truffles, and coffee. These stink bombs are very real, but they might not be meant for us, plant physiologist Anthony Trewavas said in New Scientist. It’s possible that the chemical clouds might be designed to ward off other plants encroaching on the mimosa’s territory. “The fact that they are smelly to us is irrelevant,” he said. M. pudica is not alone in its odiferous habits. Musah has already found six other farting Mimosa species, and is currently expanding her research to other genera. It’s possible, Musah said, that this aggressive flatulence is a widespread plant phenomenon. Until we know more, we’ll just have to content ourselves with the knowledge that we live in a world that contains farting plants.